in my opinion, there are few things more delicious than fresh, local strawberries. if you’ve only had store-bought strawberries, you must try some berries from your local farmer’s market – they have so much more flavor + sweetness than their store-bought cousins. they’re amazing just on their own, or baked into all sorts of goodies, like donuts, pies, or my new favorite, these amazing scones. this was my first time making scones, so i was a little unsure how they’d come out. thankfully, they turned out absolutely amazing! they have a perfect texture – a crunchy, sugary outside, with a soft, fluffy berry-studded inside. while the strawberries + sugar topping add some lovely sweetness, these scones are not too sweet at all – a must for me for breakfast treats. awesomely, these scones are freezer-friendly. after making the dough + slicing them into wedges, you can freeze the individual un-baked scones (pictured below), then just bake one straight from the freezer whenever you’re craving a wonderful treat. how fabulous is that? or, feel free to make all eight at once. just don’t blame me when you eat them all in one day – they’re truly just that good! in a small bowl, whisk together the egg, yogurt, milk, vanilla extract + lemon zest until blended; set aside. add the frozen strawberries + milk/egg/yogurt mixture to the flour mixture + mix on a low speed until dough has formed – it will be sticky + thick. transfer the dough to a well-floured work surface + pat into a round disc about 7-8″ in diameter, 1″ thick. sprinkle the top generously with additional granulated white sugar. slice the disc into 8 wedges. to bake the scones, preheat the oven to 400˚F. line a baking sheet with a silicone baking mat or parchment paper. place the shaped scone wedges on the prepared baking sheet + bake until lightly browned on top, about 15 minutes. let cool a few minutes before serving. I absolutely love fresh strawberry scones. I’ve actually been meaning to make them for quite some time now! And thanks for the freezing tip. I didn’t know scones were freezer-friendly. i love scones! these look so great. when i was little my family & i used to go strawberry picking….now THOSE are some great berries! Fresh strawberries are sooo much better…I still eat the other ones all year, but I look forward to strawberry season so much! These sound like a perfect breakfast! love these amy! I’m a complete fool for scones. then you stick strawberries in them and I go crazy. wish i had one right now! I completely agree that nothing is better than fresh, local strawberries. I’m sure you saw my post about getting some at the farmers’ market. 😉 So so yummy. And these scones look absolutely heavenly! Your first scones?! But scones are so heavenly! I suppose you can buy them where you are, though. I don’t think I’ve ever had local strawberries. Today I saw German strawberries for the first time this year, and they were six times as expensive as the Spanish ones. SIX times! And they’re not even local – just domestic. But I’m going to go strawberry picking in a few weeks and those will obviously be local. I don’t know why I’m rambling on about strawberries. Your scones look lovely and I love the crispy sugary topping. These scones are just so gorgeous–I love the photos! And strawberries are my favorite scone filling. We purchased an entire flat of strawberries from a local strawberry farm this year, and it’s still not enough for me. These scones look great! I also bought an entire flat of blueberries from a local blueberry farm last week, they are ready here in NC! blueberry season is right around the corner here, too – can’t wait because i absolutely love blueberries, especially with anything lemon. yum! loooove me some scones. these look so perfect! thanks for sharing the recipe – love that your recipe is vegan + easy to adapt to other flavors (lemon vs orange, different types of dried fruit, etc.) – awesome! 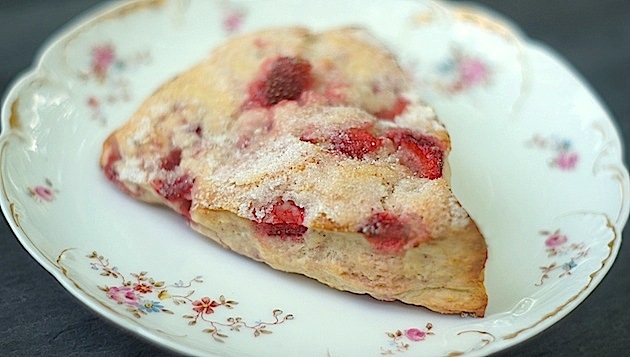 Now you know I’m looking for strawberry recipes and scones are just so good! I see them as not only breakfast treats but snacking treats, late night treats. Such a pretty picture with them all cut into the triangles too. 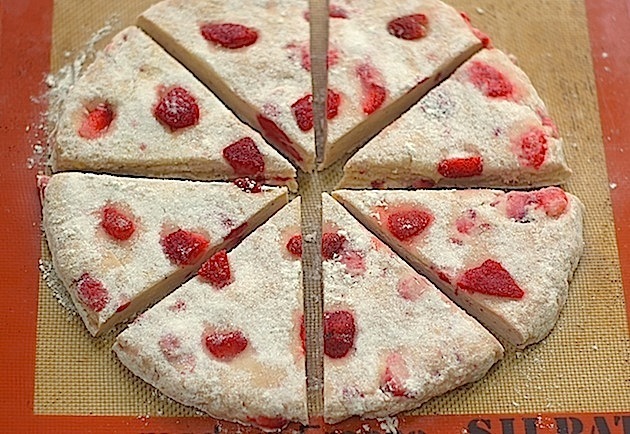 it looks like a pretty little strawberry pizza so gorgeous! love strawberries. OH LOVE THESE! Hope you’re well! I was recently thinking that i need to knock scones off my cooking bucket list. I know that I could make them, but anything baking really requires me to psych myself up. These are so gorgeous that I think I need to get over myself and get rolling!! I haven’t found anywhere around me to pick strawberries this season and i’m afraid it’s too late i really need to hop on that bus to do that next year. these scones look absolutely scrumptious and it’s something I have yet to make! putting it on my list for sure! These are absolutely BEAUTIFUL! That photo of them on the baking sheet makes me want to JUMP! through my screen! Howdy folks, amy’s husband here. everything my lovely wife creates is delicious, but every so often there are special gems that make me want to shout “everyone put this in your mouth and eat it!! !” like a crazy person, and this is one of them. I’m a breakfast baked goods junkie (it’s an excuse to eat dessert in the morning), and these have just the plausible deniability required for morning noshing — it’s not a cake (“it’s a scone”), it’s healthy (“there’s fruit in there!”) and there’s not too much sugar that it blows your cover. So go buy some strawberries and make these already. They taste like spring. You won’t be sorry. I have been thinking about these since you mentioned them on Twitter! I am definitely looking forward to trying these scones – they look delicious. I think I’m going to need a dump truck to tote home all the strawberries for the recipes I want to try this season. These look delicious! I’ve had some bad luck with grocery store strawberries lately, so I may need to take your advice and hit up the farmer’s market. There’s nothing better than fresh fruit from the farmer’s market–and what a wonderful way to use those strawberries! Your scones turned out absolutely amazing! These look great – I am always bookmarking scone recipes but I never actually made them. 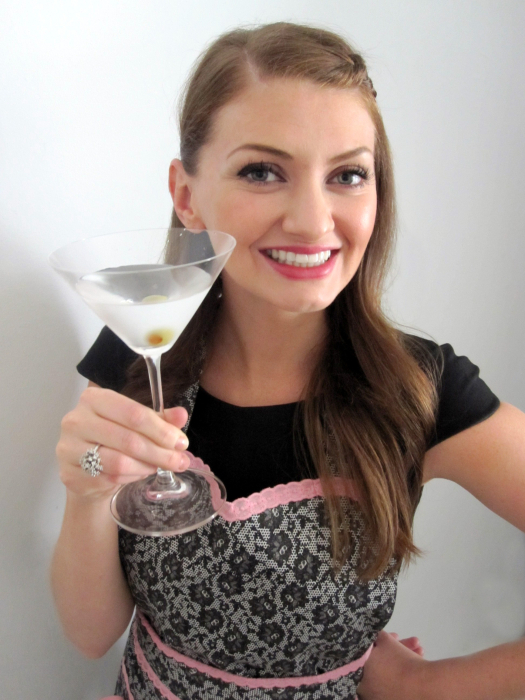 hopefully you try making them soon – i was thrilled at how easy they were to make + how awesome the results turned out! Scones with fresh fruit always top the list! these look great, Amy. Love the first picture. I love fresh strawberry scones. Strawberries from the farmer’s market are the best! These look great. Inspires me to make some scones! These scones look so great, Amy! Love your use of fresh strawberries and lemon zest. I bet these would be great with a lemon glaze, too! Thanks for sharing. Have a great weekend! ooh, you’re right – these would be awesome with a lemon glaze. great idea, georgia! I am a huge scone fan and these look so pretty! Totally in love with strawberries! This looks amazing! YUM! Would you believe if I told you I have never eaten a scone before? Never. But this looks so good, and I love strawberries, so… maybe you will see something similar coming out of my kitchen sometime soon! Hi there! Apologies for my MIA-ness, but I’m back! And seriously, Amy, this is the best post to see! I actually really love the freezer friendly piece, as you know, I’m normally the only person eating what I cook. The blog is looking great, and I have a lot of post reading to do! Have a great memorial day weekend….enjoy the nice Tennessee weather! yay, great to see you back, megan – i’ve missed you! hope all is well with you + hope you have a fantastic memorial day weekend! ohmygosh, don’t even tempt me with this. It looks amazing. I’ll have to have another tea party for these! i love the china your scones are on (and of course the scones look delish too!) have a good long weekend! Our strawberries aren’t ready yet. Ugh! I want them now. I love scones, these look amazing! Great minds must think alike, because I made strawberry scones right around the same time! (I made them the day before Ellliott was born, so I made mine on Sunday, May 20th) I just knew I had this urgency to do something with the strawberries I got in my CSA the day before. Good thing, because I wouldn’t have had the chance if I had waited! Yours look divine!